This fabulous butter knife was made by the renowned Elizabeth Eaton and is hallmarked for London 1856. It has a faceted octagonal bloodstone handle mounted with a silver ferrule engraved with laurel leaves. The extremity of the handle with silver button. The reeded blade fully hallmarked. This is a stunning piece with exquisite attention to detail. Work by female silversmiths is highly sought-after. Elizabeth Eaton was a fine silversmith specialising in flatware. She was the widow of William Eaton who died in 1845. She went into partnership with her son John Eaton in 1858, Their firm was acquired by Henry Holland & Sons in 1864. The marks of Elizabeth Eaton lasted 13 years and are therefore very sought-after. Date letter "a" for 1856. Both silver blade and stone handle in excellent condition. Length: 20cm / 8 inches. 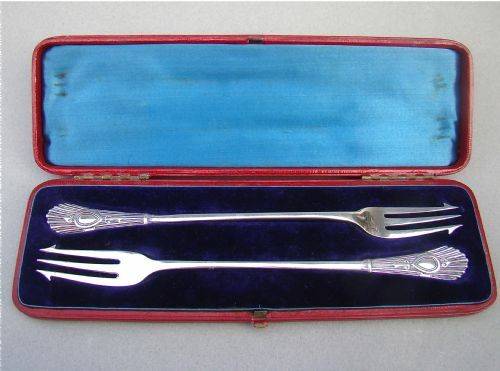 These Victorian silver pickle forks have a very elegant design. They were made in Sheffield 1891 by the prolific Atkin Brothers. The long stems with a fan-shape terminal, vacant tear-shaped cartouche and applied-strap work designs. Fitted in their original red Morocco leather presentation box. The interior of the box lined with satin and velvet. Date letter "Y" for 1891. Length: 17.5cm / 7 inches. 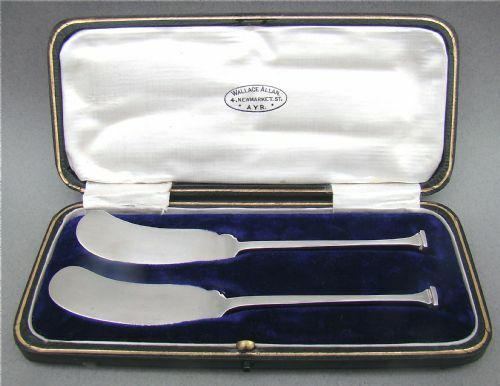 These elegant solid silver butter knives were made in Sheffield 1915, making them exactly 100 years old. The design is in the ever popular seal top pattern. The knives look contemporary and are fitted in their original case. the exterior black Morocco leather, the interior lined with cream satin and dark blue velvet. Would make an ideal wedding present. CB&S for the Cooper Brothers & Sons Ltd. Date letter "x" for 1915. To pay via PAYPAL, click on button below, please do not forget to add postage. 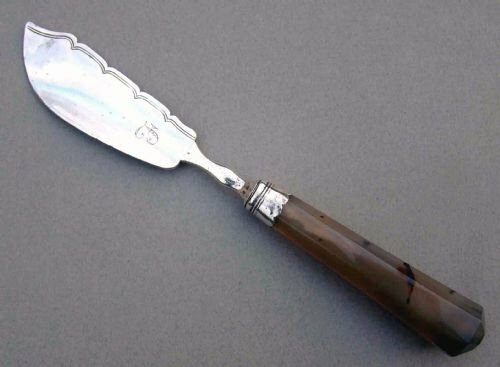 This stunning silver butter knife is dated London 1877 and bears the marks of the sought-after maker Henry Holland. The blade typically engraved with sprigs of flowers and stylised leaves above an oriental mask, the handle with a bright-cut border. Date letter "B" for 1877. Length: 19.5cm / 7.5 inches. Postage UK: £7 Special delivery. 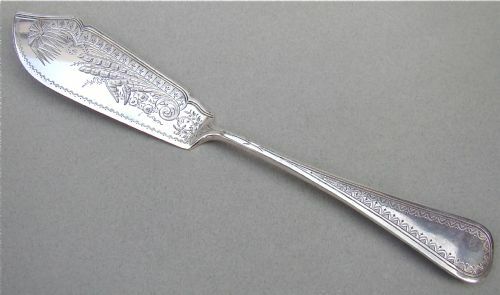 This superb George III silver butter knife was made by Thomas Peacock and is hallmarked for London 1800. Faceted moss agate handle mounted with silver ferrule. Reeded silver blade. Initialled with letter F.
Minor surface wear on blade. 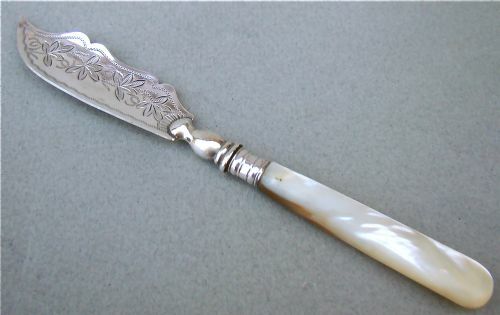 This is a small and very pretty silver and mother of pearl butter knife hallmarked for Birmingham 1814. 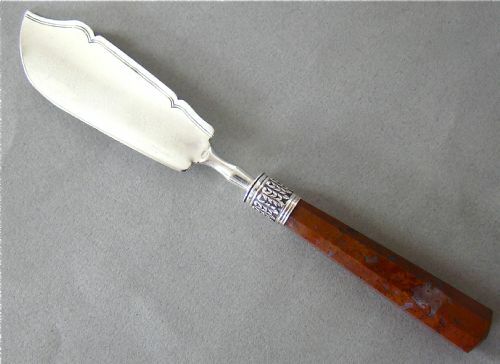 The blade is charmingly bright-engraved with leaves and is mounted on a simple mother of pearl handle. H&T for Hilliard & Thomason. Date letter "O" for 1888. Both silver blade and mother of pearl handle in excellent condition. Length: 13.5cm / 5.3 inches. 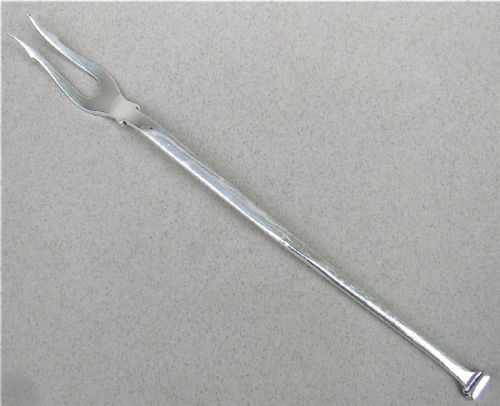 This is a useful and stylish solid silver pickle fork. The long stem terminating in the the sought-after and very elegant seal top pattern. Date letter "y" for 1939.